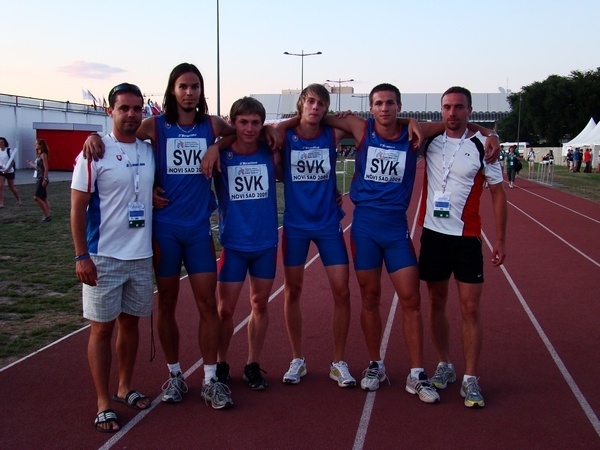 V zÃ¡vereÄ�nÃ½ deÅˆ MEJ v Novom Sade utvorila Å¡tafeta SR na 4 x 400 m v zloÅ¾enÃ­ (Roman TurÄ�Ã¡ni, JÃ¡n BeÅˆa, DuÅ¡an PÃ¡lenÃ­k a Juraj MokrÃ¡Å¡) vÃ½konom 3:14,42 sek. novÃ½ slovenskÃ½ juniorskÃ½ rekord. SlovÃ¡ci sa predstavili vo finÃ¡le s cieÄ¾om obhÃ¡jiÅ¥ 6. prieÄ�ku z rozbehov a cieÄ¾om pokoriÅ¥ 15-roÄ�nÃ½ rekord kvarteta (Riedl, JarÃ¡bek, LopuchovskÃ½, HolÃºbek, 3:15,09 sek.). SlovenskÃº Å¡tafetu v novosadskom finÃ¡le rozbiehal Roman TurÄ�Ã¡ni (SlÃ¡via UK Bratislava), na ktorom sa uÅ¾ prejavila Ãºnava z predchÃ¡dzajÃºcich Å¡tartov na 200 a 400 m a svoj Ãºsek zabehol za 49,62 sek. Napriek tomu, Å¾e iÅ¡iel takmer o sekundu pomalÅ¡ie ako v sobotÅˆajÅ¡Ã­ch rozbehoch, sa mu podarilo udrÅ¾aÅ¥ 6. pozÃ­ciu pred Turkami a Ã�rmi, Ä�o bolo pre Ä�alÅ¡Ã­ priebeh preteku dÃ´leÅ¾itÃ©. Na druhom Ãºseku odovzdÃ¡val JÃ¡novi BeÅˆovi (AC Malacky), ktorÃ½ po veÄ¾mi rÃ½chlom zaÄ�iatku sa v zÃ¡vere nevyhol stvrdnutiu a prebiehal za 49,21 sek. Na treÅ¥om Ãºseku beÅ¾al DuÅ¡an PÃ¡lenÃ­k (Å G StavbÃ¡r Nitra), ktorÃ½ zaznamenal najrÃ½chlejÅ¡Ã­ medziÄ�as s pomedzi vÅ¡etkÃ½ch SlovÃ¡kov (47,65 sek.) a zvÃ½Å¡il nÃ¡skok pred dobiedzajÃºcimi Ã�rmi. PoslednÃ½ Ãºsek bezpeÄ�ne kontroloval Juraj MokrÃ¡Å¡ (Spartak Dubnica), ktorÃ½ s prehÄ¾adom doviedol Å¡tafetu do cieÄ¾a (47,94 sek.) na pÃ´vodne 6. mieste a v novom slovenskom juniorskom rekorde 3:14,42 sek. RadosÅ¥ z vÃ½konu umocnil fakt, Å¾e po diskvalifikÃ¡cii poÄ¾skÃ©ho kvarteta si SlovÃ¡ci vybojovali historickÃº piatu prieÄ�ku v konkurencii najlepÅ¡Ã­ch juniorskÃ½ch Å¡tafiet na 4 x 400 m starÃ©ho kontinentu. Ã¯Â»Â¿xiaolong1018While modern society advances and also civilizations coach factory outlet store turn into more subjected to to one another, there's a slow motion away from stereotypes. Now girls tend to be regarded coach outlet to become fairly separate, quite callous along with willing to leave home that will earn a living. Males are becoming fewer of your Ã¢Â€ÂœkingÃ¢Â€Â� at your home are usually slowly and gradually placing the particular Coach Outlet Online attention of the young children as well as health care belonging to the household. Functions have grown to be contributed besides segregated and societies which have been much at the rear of the following gender coach outlet online store further advancement are increasingly being invited in order to catch in place. For a long time these stereotypes connected with females and males was employed diligently by almost all countries. Considering the modifications in the economic globe and the importance society spots with education and learning and vocation coach factory store women and men are now being pressured to ascertain parallel roles. With most sub cultures, women emerged seeing that unfavorable bugs. They aren't because formidable along with a lesser amount of bright over a dude. There're is not capable of surviving by themselves and want to spend his or her period at your home baking, Michael Kors Handbags clean-up along with obtaining youngsters. Women of all ages are viewed while kinder plus milder than the usual guy is definitely but much more temperamental. Females usually are thought to be Michael Kors Outlet Handbags naggers, talkers, as well as spenders. Also girls usually are predicted continually to take a look their best to create by themselves suitable in order to male.